Pink Peppermint Cards: Creative Challenge - Birthday Card Stash! 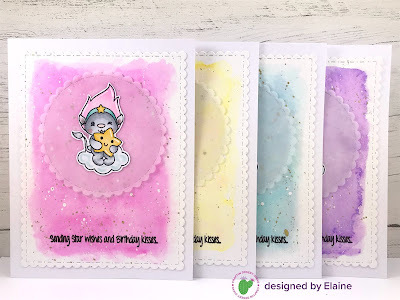 Creative Challenge - Birthday Card Stash! Hi everyone! 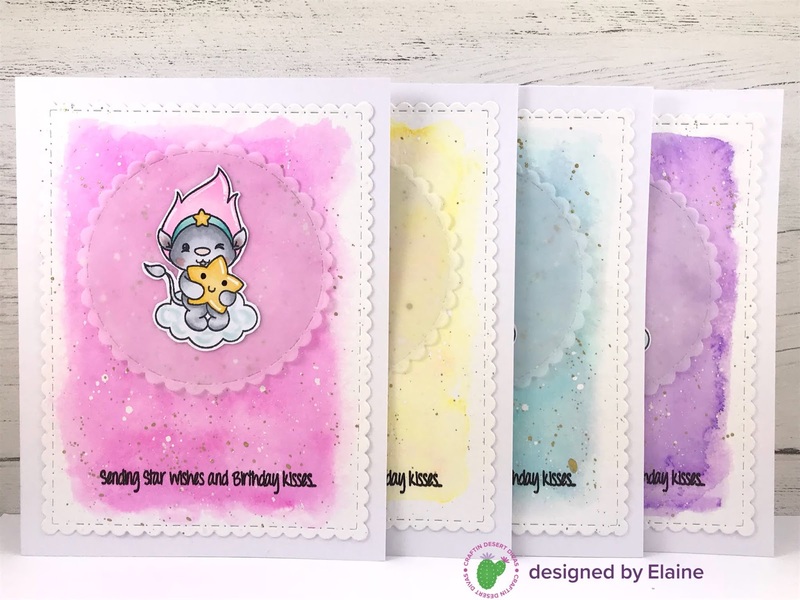 Today is my first post for Craftin Desert Divas and I'm super excited to share this set of super sweet cards I made this week! I took some slightly textured watercolour cardstock and diecut four of the largest scalloped frames from the fancy frame die set. I then scribbled on four colours of zig clean colour real brush markers, one colour on to each panel. To blend the colour in I took a wet wide paint brush and moved the colour around until it covered the whole panel more evenly. Finally I sprayed each panel with my mini mister and left to dry naturally. To speed this up you could blast with your heat tool! 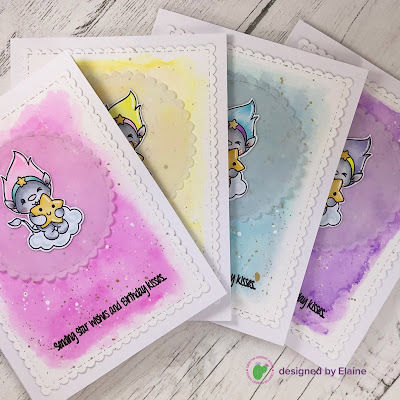 When I make cards in batches I find it easiest to do things in a conveyor belt style and do all the same tasks at the same time. For example, I die cut the large rectangle frames and the vellum circles all at the same time. The vellum circles were cut using the third largest die from the stitched in circle die set. Once my watercoloured panels were completely dry I tapped on some watered down copic opaque white paint and Windsor and Newton ink in gold. Once the splatters were dry I used my misti stamping tool and stamped one of the sentiments from the stars & wishes stamp set using my Versafine onyx black ink on to each panel. I stamped each sentiment several times to get a good impression on the textured cardstock. Whilst my misti and stamp set was still out I stamped my troll from the same stamp set on to copic friendly cardstock with memento tuxedo black ink. If I'm really in a rush to get cards done I'll often use images I've already got coloured up! I kept the colouring super simple and where possible the colours the same on each troll. The only colours that are different on each one are the headbands and hair. I've listed below all the colours I used. Once all the colouring was done I fussy cut them all out and adhered them on to my vellum circles. I ran the trolls through my xyron sticker maker for easiness and speed. I used double sided tape on the back of the vellum circles and secured to my water colour panels. Finally I used my ATG to apply lots of adhesive to the back of the watercolour panels as they were quite warped from the water I applied to them. I then stuck them to my cardbases (which I had premade). Thank you! Love this stamp set it so adorable! Adorable cards. Love the background.